Longtime readers will recall I’ve been working my way through every running shoe ever made. I began the experiment 35 years or so ago with adidas (rom?). It’s only fitting that I end with the Zante. If you’ve been under a rock for the past year, or you don’t follow every shoe made by every manufacturer in the planet, you don’t know about the Fresh Foam Zante. New Balance finally ran out of numbers to name its shoes, so it started making up names. Zante is the name of an island somewhere, or possibly the record company guy Fogerty mocked after a lawsuit in which the company sued Fogerty for sounding like Fogerty. But that’s not really part of my shoe review. Although I’ll be humming Willie and the Poor Boys for the duration of the review. Which is this. I was thinking about the Zantes this morning. And the thing I thought is that I have NEVER thought about the Zantes. From the first time I put them on till the time I took them off yesterday, I have not given them one thought. And what more could you ask for in a pair of running shoes? Other than a built-in medium chocolate frosty machine, which likely would have a significant impact on the weight. No shoe works for all people. Except of course for the Trump, which will work so well it will make your head spin. But after all these years, this shoe is the one that works for me. It’s light, but not TOO light. 8 ounces, I think. A 6mm drop, somewhere in the middle of the spectrum. And a snug midfoot combined with a wide toe box. Lordy, my toes love to splay. Inside, the shoes are super smooth. No seams, nothing to rub, which is huge when your religion doesn’t allow you to wear socks. This is why I never became a county clerk. I would be unable to give out sock licenses. And they have a woven sort of a top that’s very breathable, a must in a land that never drops below 110 degrees. Somebody on letsrun described them as “house slippers woven from Jesus’s beard hairs.” This is clearly wrong because AP style says proper names ending in S should have only an apostrophe and not an extra s. But you get the idea. I have a bunch of miles on them already (maybe a couple hundred?) and they show no signs of wear. They have developed a pleasant aroma, no doubt from the lanolin. For some reason they don’t have the stench of the Piranhas, and the cat has yet to attempt to bury them in the litter box. Even the laces are fantastic. A semi-stretchy material that works great, and is easy to dance to. The colors are weird, but I’ve been wearing sunglasses, so whatever. I put them on, and I run. Usually in that order. No blisters, no pain, no ITBS, no lo contendre. Bonus: It only costs about a hundred bucks, less than the cost of a commemorative sweatshirt at the Disney Marathon. Added Bonus: ZANTE is much more fun to say that 110, the name of my previous favorite new balance shoe. Minus: Having to say Fresh Foam. That whole Will Smith thing is a bit weird. And we forgot the victory ceegars after Pandora anyhow. 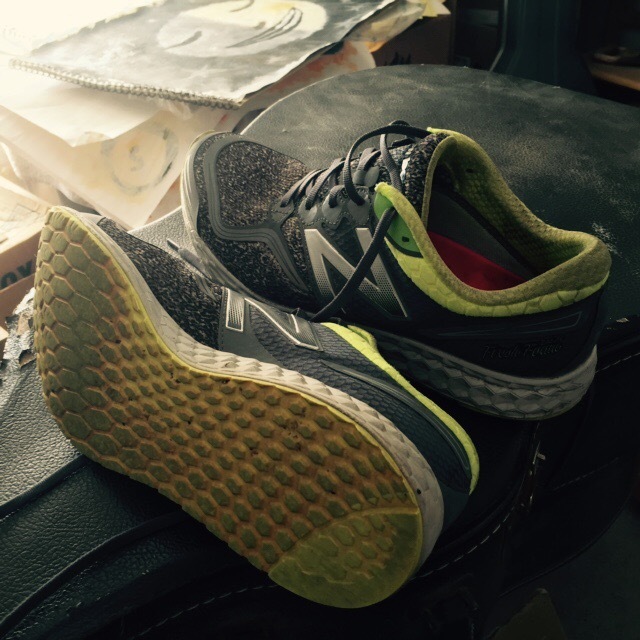 • The New Balance Fresh Foam Zante (with lanolin) is a fine shoe. I would definitely grant you a license to marry it if I were a city clerk. • Creedence makes a great running soundtrack. • When using Jesus’ name as a possessive, the second S is not needed. • Please don’t make me run in the Trump. The Fresh Foam Zante. Moon sold separately.